On April 11, 2014 Lorinda Schrammel presented The Power of the Strength Zone to our membership. Our attendees enjoyed our discussion about identifying and leveraging our strengths in the workplace to maximize employee engagement and employee performance. As supervisors and managers we are better equipped to develop employees based on their natural strengths which can promote higher performing workplaces and support employee engagement. Lorinda Schrammel is the Training and Development Manager at Oklahoma State University in Stillwater, Oklahoma where she is responsible for training and professional development programs for staff and faculty throughout the university. Prior to joining OSU, Lorinda was an independent management trainer and consultant for twelve years working primarily with business and industry clients throughout the state of Oklahoma. Lorinda received her Bachelor’s degree in Communications from Baylor University and is active in local and national American Society of Training and Development chapters. DON'T MISS OUR SPECIAL EVENT! Have you registered for Jim Stovall Presents: Ultimate Productivity? Don’t miss out on this special event! CLICK HERE for event details and registration! Join us April 25, 2014 from 9am to Noon! We are excited to announce our upcoming Training Design Basics course! Training Design Basics celebrates the fast-paced, ever-changing reality of organizations today. Jobs, roles and expectations change quickly. One day you might find yourself a subject matter expert on a topic, and the next day you might be asked to train 50 people on your area of expertise. Training Design Basics is designed to be your one-stop solution for designing training programs. It is the perfect tool for new trainers, facilitators new to training design, and non-trainers taking on a training design role for the first time. Students will experience minimum lecture, and maximum hands-on instruction with a specific end in mind based on real-life workplace needs. Students will receive the book “Training Design Basics” from ASTD Press, and will create a personalized training plan document that can be implemented in his or her workplace immediately. This course is perfect for new trainers, facilitators that are new to training design, and non-trainers taking on a training role. Topics included in this course include Planning Training Projects, Instructional Objectives, Organizing Courses, Strategies for Presenting Content, Developing Course Materials, Producing Learning Materials, Evaluating Courses, and Administering Your Course. 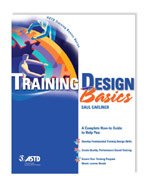 As a participant, you’ll receive a copy of Training Design Basics by Saul Carliner, have the opportunity to develop a personalized training plan, and receive feedback and input from professionals in the field of Training and Development. This course will offer 21 hours of classroom instruction. Classes will meet at the University of Phoenix on consecutive Wednesdays, beginning on July 9th, and ending on August 20th. Classes will be held from 2pm-5pm. Enrollment will be limited to 15 participants. For additional information, contact: Chris Woodard at cawoodard@aep.com. CLICK HERE to register.